I've been happily using the tChess Pro (currently version 1.7.3; $7.99) iOS app for over a year, and I thought I would share some ways I use it. Some of my ideas could also be used with other chess software, but a major appeal of tChess Pro is that it runs on a mobile, instant-on, touch screen device. My old, slow desktop PC remains useful for certain tasks, but I tend to avoid using it if I can reasonably do things without it. If you're already doing chess study on a personal computer with UltraHyperScrumpdillyiciousDatabase, you may find much of what I describe to be rather primitive compared to what you are doing. However, I enjoy relaxing around the house with tChess Pro on my iPad, sometimes accompanied by a chess book. tChess Pro also runs on the iPhone and iPod Touch. 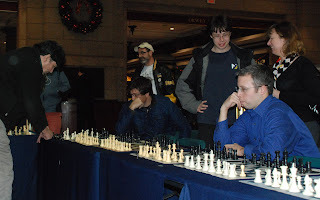 I generally play in only a few tournaments each year, and play little, if any, other chess. I am consequently normally rusty, but I (try to!) take my preparation for rated games relatively seriously. Below are some ways I use tChess Pro for chess study, and for making chess diagrams. tChess Pro makes reviewing games so convenient that I gave away the small analysis chess set which I formerly used. I save games in PGN (Portable Game Notation) in tChess Pro, allowing any position in any game to be recalled without having to set up physical pieces, saving time and eliminating frustration from possibly mistaken piece placement. Then, tap the triangles to go forward or backward through the moves. I often review my own games multiple times, since I have difficulty remembering what moves I played even a short time after a game (yeah, I know, shocking, isn't it?). Before buying tChess Pro, I had already saved a variety of games in PGN files. By e-mailing those files, each of which could have one or more games (or positions), to myself as attachments, I was able to import them into tChess Pro as PGN database files. The original file names are carried over, so as preparation for the import, I grouped selected games into opening-specific files. I named the files in ways to keep certain groups of games together and to make them identifiable from short names: the PGN database file names are limited to the width of a portrait orientation window on an iPhone. 1/31/13: I revised everything between these two horizontal separator lines, having discovered that my previous annotation example had some problems due to my having done some nonstandard editing on the PC prior to e-mailing the game to myself for use in tChess Pro. Along the way I discovered some additional functionality, which I am also describing. tChess Pro comes with a PGN database file of Bobby Fischer's games, and provides an option to additionally download a PGN file of the 2008 World Championship games, plus another of Garry Kasparov's games. I discovered a variety of chess book PGN files (normally without annotations) on the Internet, including some matching two of my most frequently used opening books. For someone like me who strongly prefers Algebraic Notation, these files make it far more appealing to work through games in books printed using Descriptive Notation! tChess Pro numbers the games in a PGN database file sequentially. If the games in a book are numbered the same way (e.g., the first game is labeled "Game 1", as in my Zürich 1953 tournament book), you can directly correlate matching games. The games in many books are not, however, so numbered. For those, the search function can be helpful, allowing you to search all the tags found in the PGN for games (or positions). You can search for one or more items. Searching for "1/2-1/2" brings up all the draws in a file. Of course, you would need to confirm that the tags in the PGN actually do contain the values you're expecting. For instance, if draws are not recorded as "1/2-1/2" in the result tag, there is likely no way to search for draws. Searching for both players' names (an "and" search, not an "or" search) helps if you select a random chapter in a book and want to find games the two played against each other. One time when I was not using tChess Pro, I was working in my head through the notes to a diagram in one of my Descriptive Notation books by looking back and forth between the diagram and the notes. I was puzzled by one of the later moves because I had failed to notice the "ch" at the end of an earlier "Q x P ch" move. Instead of that move, I had mentally played a different "Q x P" (not check) move, which invalidated my subsequent mental picture of the position. I certainly make similar (though, I suspect, fewer) mistakes when working with Algebraic Notation, but being able to simply tap triangles to move through a previously saved game, instead of moving pieces by following (or trying to accurately follow!) printed moves, eliminates chances for errors. The first step is unnecessary if on my PC I already have the PGN file equivalent of the tChess Pro PGN database file. (hey, I can't give away my serious opening secrets here). I use lower case letters whenever reasonable because they take less space than upper case ones, and as mentioned above, there are screen display width limitations. Within such a file, I sort games into two groups, my own, and all others. Within each of those groups, I order games chronologically descending. This grouping and ordering facilitates finding games, and also adding future games. For chess book PGN database files for which I have the printed book, I start the names with "1_", so they will appear in the next group. I add on the author(s)' last names, followed by the (typically shortened) book title. For tournament PGN database files which might be of interest to me even though I don't have a printed book, I started the names with "2_", putting them in the next group. After that come all the assorted other PGN databases, which I tend to use less often. A chess book PGN file (1_znosko-borovsky_artCombination.pgn). A tournament (book) PGN file (2_palmaDeMallorca1970.pgn). 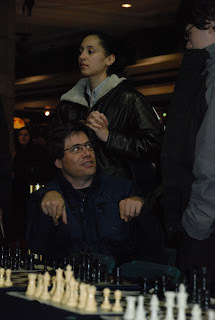 A game I exported from tChess Pro and e-mailed to myself (chess_122412_1552.pgn). 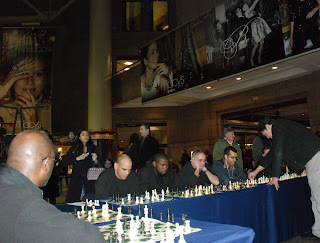 Such games are named "chess_" followed by a date and time stamp. I later often incorporate such games into a larger group (e.g., 0_scholars_mate) on my PC and (re-)import that into tChess Pro, then delete the original date-and-time-stamp-name PGN database file from tChess Pro. 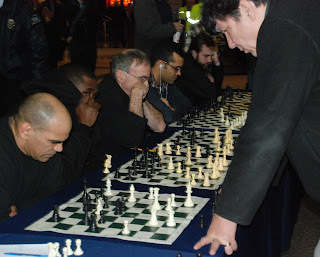 The three I mentioned from tChess (fischer60.pgn, kasparov.pgn, wc08.pgn). A miscellaneous collection of my own games (ho_k.pgn). The game in which Neil McDonald, one of my favorite chess authors, swindled a draw from World Champion Kasparov - see screenshot below (kasparov_mcdonald_1986.pgn). tChess Pro's internally saved games (saved_games.pgn). to increase the chance of the entirety of a game's date, which helps identify it, showing in listings in PGN databases. It helps that my last name is very short; if your last name is Znosko-Borovsky, you will have less luck with this approach, but there's always the ever-popular "Me", as often appears on scoresheets. My PC remains my base for PGN files. I e-mail those files as attachments to myself, to be saved permanently in e-mail and thus enable retrieval anywhere using wifi. That also helps if I ever need to reinstall tChess Pro from scratch. If you and your opponent don't mind sitting side by side while going over a game, you can enter the game during the post-mortem (and subsequently add tags and save it as PGN). The screens of devices smaller than an iPad may be ill-suited for such a task. It's simpler to look at things from just White's (or Black's) viewpoint, which was agreeable to both of my opponents, but you can also do the much more troublesome switching of the board viewpoint after each move. I was "shamed" into moving my knight back with 15 Nf3. 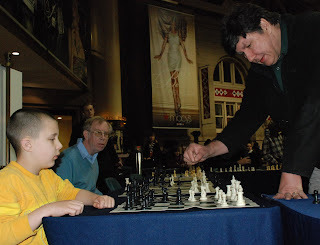 According to my recollection, John mentioned that 11 Nf3-h4 wasn't a good idea, as we saw played out in the game. Imagine my surprise when tChess Pro pointed out the 15 Nf5! possibility. Sure, I know this kind of tactic (and indeed, the "famous" Nf5 sacrifice by name), but I missed it in that game, and it seems John missed it as well, since I don't recall him mentioning it in the post-mortem. I'm hoping that tChess Pro can broaden my vision so I will miss fewer tactics such as these, which I consider to be well within my practical reach. My nephew and I each used tChess Pro on our iPads with the iOS Game Center connection (over our respective wifi) to review some of his games. For the time being I have a significant rating edge on him (who knows how long that will last; maybe someday he can help me). Game Center gives us Voice Chat, making tChess Pro into a nice teaching tool. Naturally, the board updates on both sides as each of us plays a move. Whoever's directing the play simply states the next move, and the appropriate person plays it. We stop and look at potentially interesting junctures, and rewind as needed ("Let's take back all the moves until move 10 and look at a possibility there."). We haven't actually used tChess Pro to play a game, even though that's likely the primary reason for using Game Center. I have historically used DiagTransfer on my PC to compose chess diagrams manually (making occasional mistakes, about which my friends Eric and Jason alerted me). However, while writing this blog entry I found that tChess Pro screenshots (hold down the power button, then press the Home button) can be cropped within the iOS Photos app (or, more efficiently, using the free Photo Mage app which I favor as of 1/2013) to produce chess diagrams, like the ones I used above. The resulting (color) JPEG format image files are larger than the (black and white) PNG format image files from DiagTransfer, but I'd say that I have just found my new way of making diagrams. Tom Kerrigan, the maker of tChess Pro, also makes two other iOS chess apps, tChess Lite (99¢) and Chess - Learn Chess ebook (free), which may be of interest. I cannot really comment on either of those, but he has implemented a number of my requests in tChess Pro over time, making it an even better tool. If tChess Pro sounds interesting, I encourage you to check out his http://www.tchessgame.com website, and read reviews of his products in Apple's App Store (where it may help to look for "t Chess" instead of "tChess") or elsewhere. 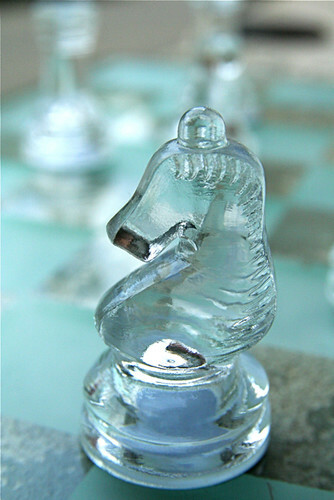 It is certainly my longtime favorite and most frequently used chess app. BCC Social Event of the New Year: Play, Eat, Reunite . . .
And: Free Food! Everyone loves to eat deli, drink soda, coffee, tea and eat lots of cakes and cookies. So bring your appetite. 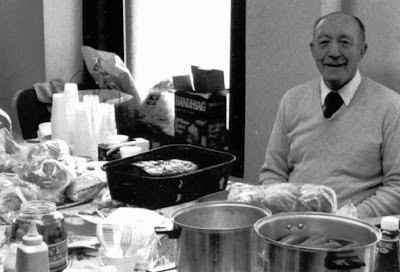 Irv Yaffe, (1921-2012) lived to be 91 years old, and catered BCC's Herb Healy for many decades. He was a vibrant member of the Club and always a willing volunteer for many of the BCC's activities. He will be sorely missed. Yet, the show will go on. Old and New people step up to the plate to bring the Greater Boston Area its premier social event: the Herb Healy Memorial. So be inspired. 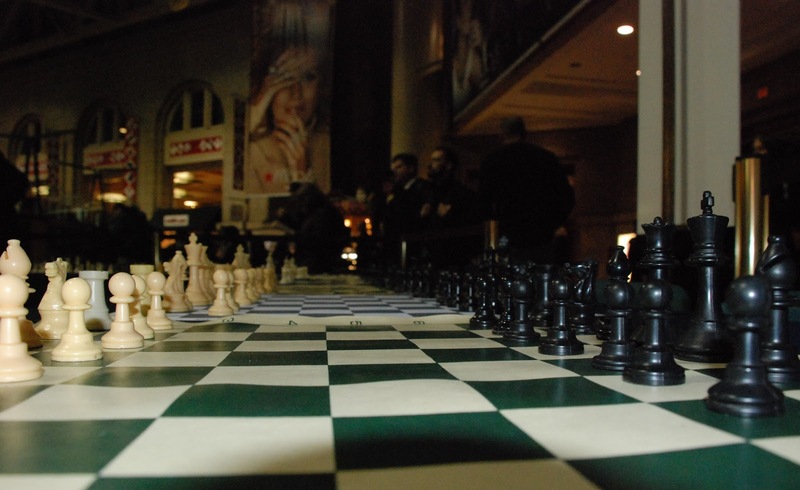 There will be lots of food, lots of chess and lots of good cheer. 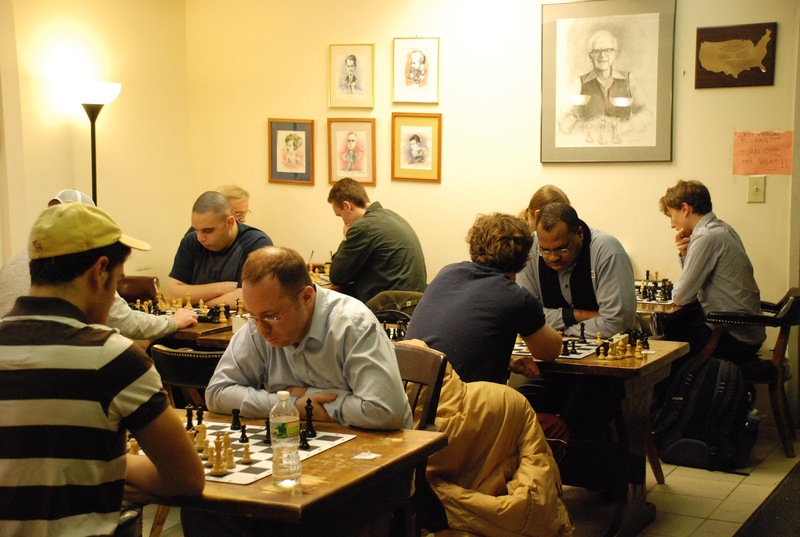 Come, meet chess players from all over the greater New England area who have been connected with the Boylston Chess Club over the many decades of its existence. So come to play, eat and socialize! 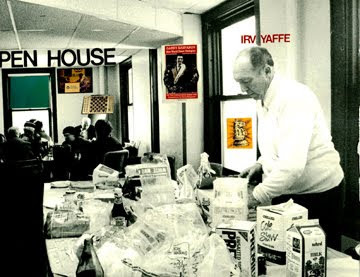 Irv Yaffe, setting up at thee BCC (circa 1990). BCC Grand Prix: This Saturday, 4SS Game 60/+5 sec. delay. Open and U1600. Low entry fee! 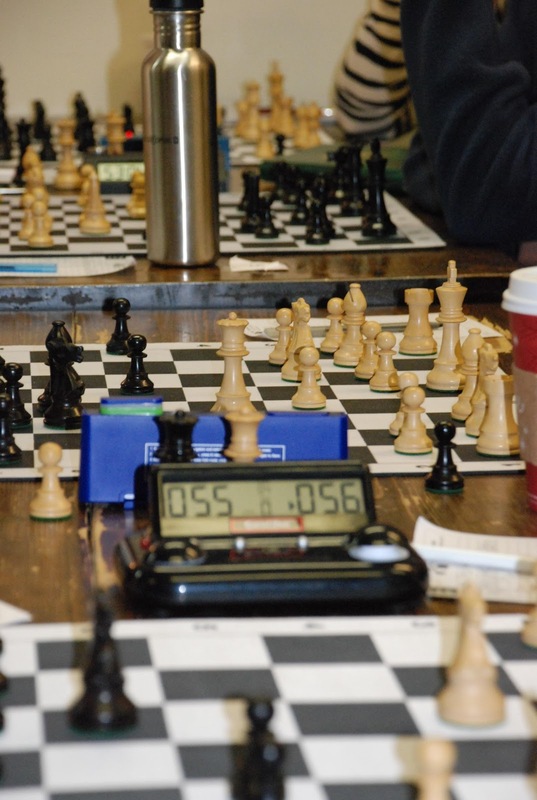 Check Boylston Chess Club Home Page "Upcoming BCC Events" for details. 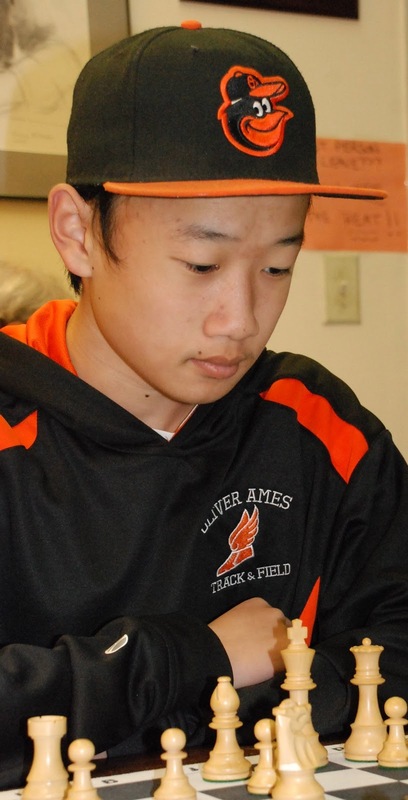 FM Chris Chase chalked up a perfect 4-0 in the Open Section of the Harry Lyman Memorial, December 22, 2012. 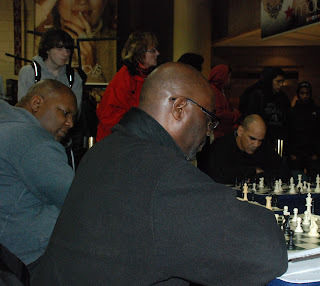 Jesse Nicholas and J. Timothy Sage went 2-3rd, with 3 points. FM Chris Chase plays Professor J. Tomothy Sage in Round 2, under the happy gaze of the portrait of Harry Lyman, Dean of New England Chess. Nithin Kavi vs Jesse Nicholas, Round 2. Robert S. Title takes clear first in U1800 Section. 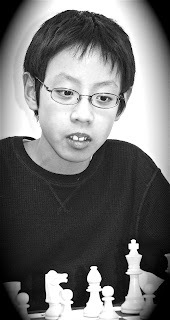 Yuanzhe was 2nd with 2.5 points. Yuanzhe Wang vs Robert S. Title, Round 1. 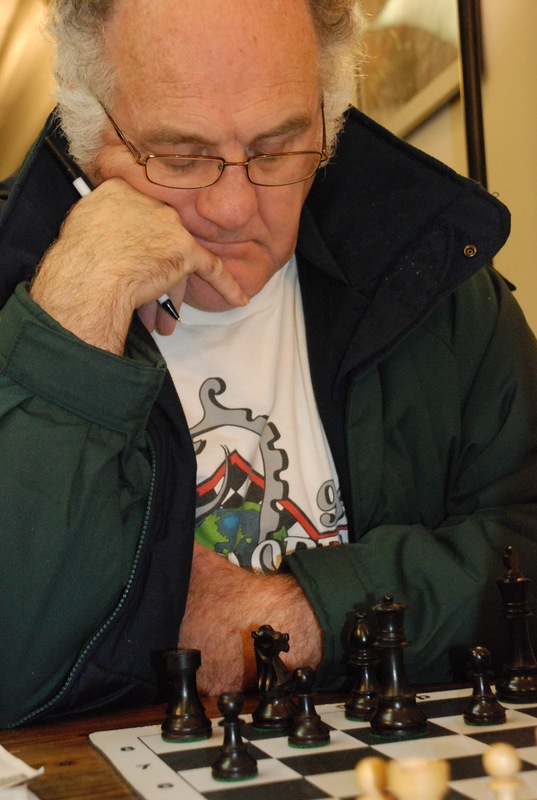 There were 28 players participating in the Harry Lyman Memorial. A personal note: Harry Lyman helped me in my time of need. No surprise, he helped many a chess player on the edge. He was there to listen. His advice was suscinct. He offered money to help, if needed. If you came to a tournament he would notice you, ask you if you are playing; if not why. Then he would offer to pay the entry fee for you to play, no more questions asked. He was a pioneer in the field of Chess and Education and led the Boylston Chess Club to sponsor women's futurities (round robins to offer FIDE titles). Harry Lyman considering the solution to a problem he invites you to share. many complex problems and combinations. 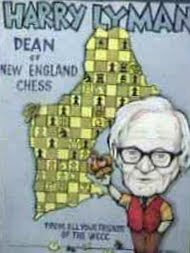 Harry Lyman made it his business to come from the North Shore every Tuesday to host the Boylston Chess Club Open House. People came from far and wide to chat, share chess stories and life. He was an open friend to all. Peter Sherwood plays black vs Harry Lyman. 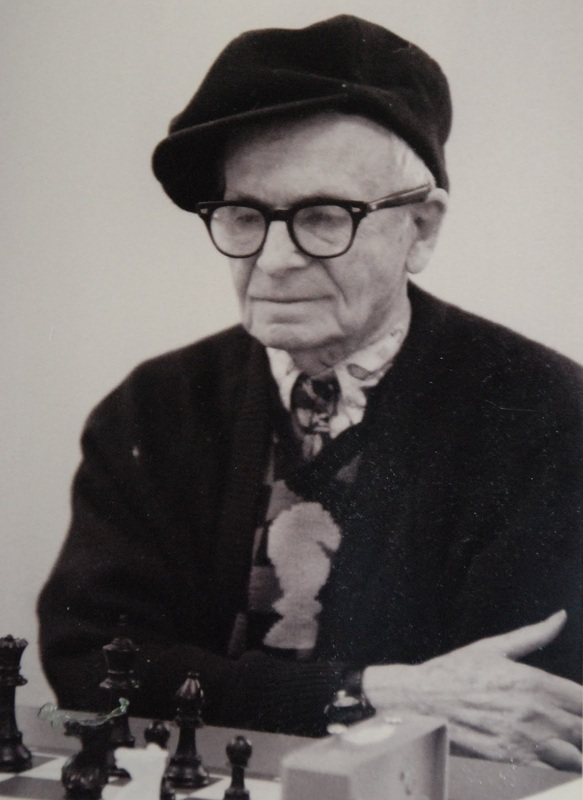 Yes, Harry was not only a chess teacher, educator, mentor and philanthroper, he was also a chess player, indeed a gambiteer! Harry Lyman won the New England Open on several occasions. His rating at that time was estimated to be 2340. In 1957, Harry won the US Amateur Championship in Ashbury Park, NJ, with a perfect 6-0. The question is: why should you participate in the Harry Lyman Memorial? I will not be playing (I will be photographing), but I am sponsoring a player, in much the same way Harry would have. 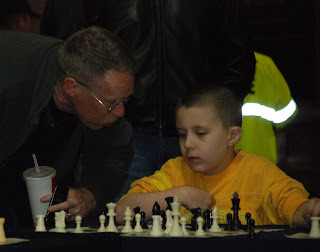 Harry knew the value of chess as an educative tool, long before the institutions of higher learning figured this out. Harry saw the need to recruit more girls and women into chess. 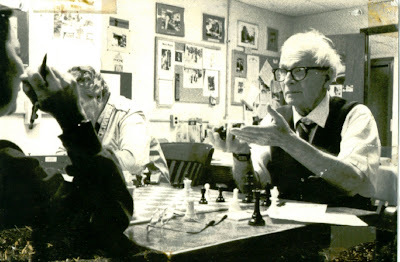 I took a photograph of Susan Polger performing a simul at the Boylston Chess Club/City Club of Boston, in 1985. This photo was published on the cover of Chess Horizons. Who would have guessed at that time that GM Susan Polgar (FIDE Women's World Chess Champion 1996-9) would found the Institute for Chess Excellence, encouraging girls to play and study chess. Harry was an integral part of the movement to recruit girls and woman, though he would deny this. He was the spark that encouraged all the rest of us to do what needed to be done. Harry didn't seek fame or credit. 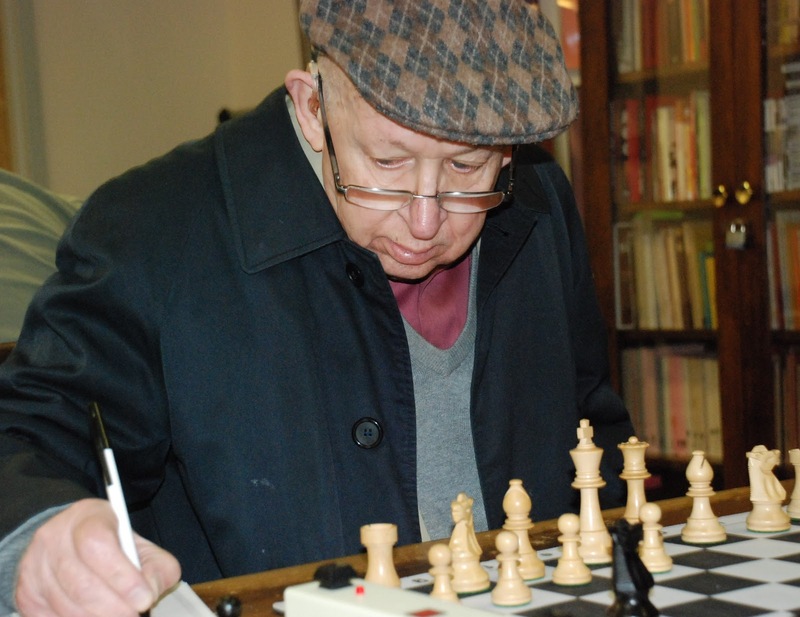 He just wanted to see the chess community do the right thing: serving all the people, regardless of race, gender or age. 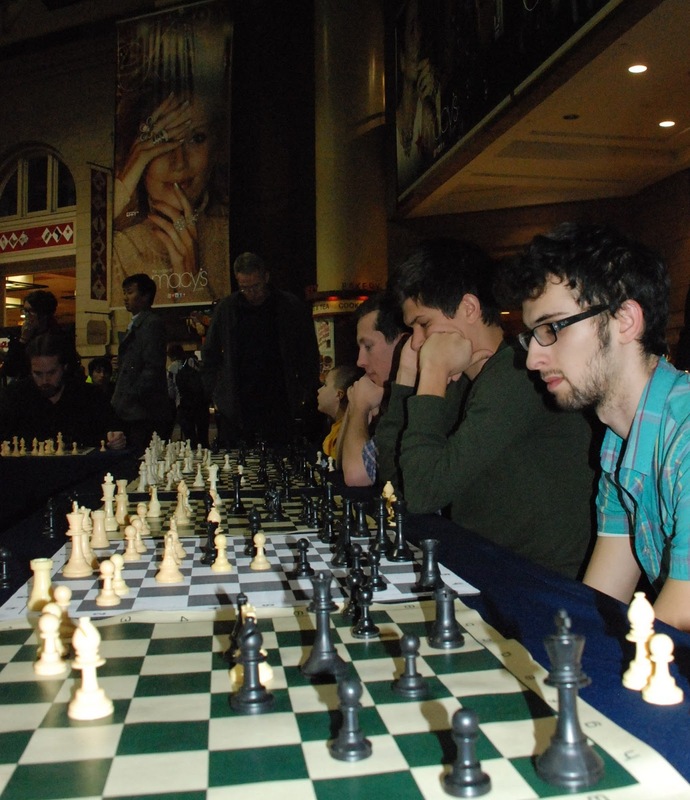 There are few chess events which are more significant in the history of chess. The name Harry Lyman is woven throughout the annals of New England Chess. Come, be part of chess history. 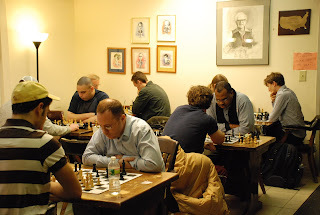 The Boylston Chess Club is well lit with Harry Lyman's portrait smiling down on all of us. 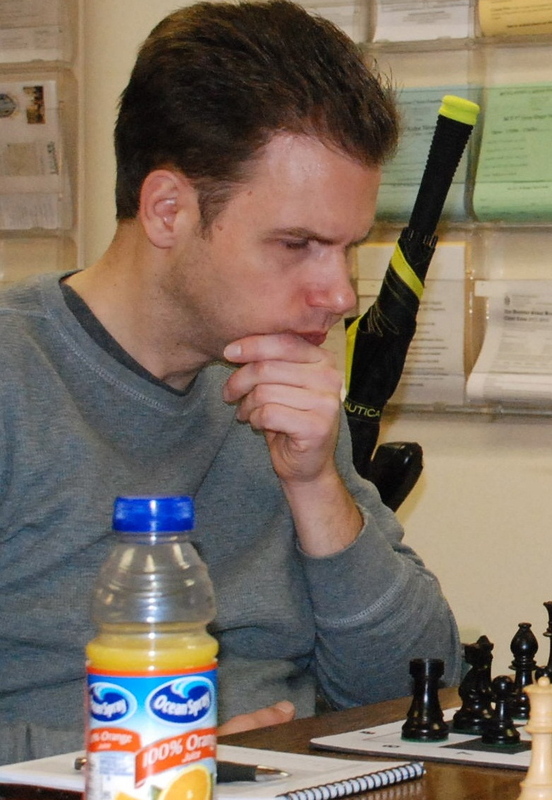 In a selective and strong field of 20 players, FM Chris Chase chessed a perfect 4-0 to win the Open Section and Alexander Roy, a perfect 4-0 to clintch the U1950 section of the Max Lange Legends of Chess. FM Chris Chase led the way with a perfect 4-0. 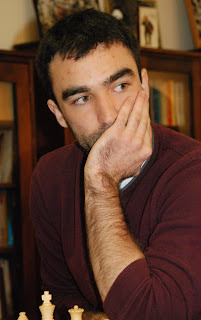 NM Eric Godin was 2nd in the Open Section with 3 points. Luke Lung who also scored 2.5 points. Alexander Roy, wins the U1950 section with a perfect 4-0. 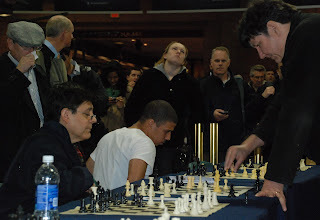 Walter Driscoll, III took clear 2nd with 3 points. scored one of his points using the Max Lange Attack! Michael Charles Brown, 3-4th, U1950 with 2.5 points. As part of our Legends of Chess series, we celebrate this weekend the German master Max Lange (1832 - 1899) who was said to be one of the top ten players in the 1860s (roughly a FIDE 2530 level). Lange was not only a player but also an editor of the German Chess Newsletter from 1854 to 1864, and organizer of the 9th Westdeutscher Schachbund (West German Chess League) at Leipzig in 1894. Lange has been etched into chess literature by his popularization of the line: 1.e4 e5; 2.Nf3 Nc6 3.Bc4 Nf6 4.d4 ed 5.0-0 Bc5 6.e5 what we call the Max Lange Attack. Lange also published Lehrbuch des Schachspiel (Textbook of Chess Games) Halle, 1856 and Handbuch der Schachaufgaben (Handbook of Chess Problems) Leipzig, 1862. So one might say that Lange was an all-around intellectual of chess. 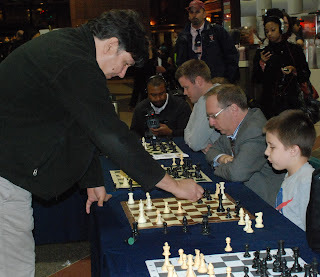 Lange's kind of chess is action-packed, full of sparks and dares, an inspiration for players to prepare an idea at home and come to the tournament and test it, as wild as it may be, in the midst and rigor of a rated chess game. You don't have to play the Max Lange Attack in this tournament, but you do have the chance to play out your own attack lines to spring on your opponents during the course of the day and see what happens! And now, Steinitz performs a relentless king-side assault, in the spirit of the Max Lange Attack, which leads to checkmate! And finally, a brief encounter between 2 New Zealanders . . . This kind of chess tunes the chess player into the notion of "timing..." one can even give up a whole piece, for the advancement of an attack which leads to checkmate! We all understand this in theory; now the Boylston Chess Club gives you the opportunity to put theory into practice! That's the real skill; and the satisfaction of such a chess game in emmense. Bring your enthusiasm, your ideas and your home preparation, for both White and Black and put your ideas into play. Discover the possibilities! So see you all this Saturday, December 15, 2012, for one wild tournament! Here are my first impressions of the GM Larry Christiansen 2 Tuesday of the Month Simul, in photos. 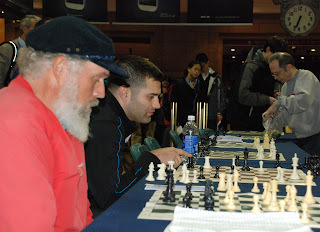 First let me say that I (Steve Stepak, Photographer) played 2 games with GM Christiansen and I learned 2 things right off the bat: firstly, Larry really knows his stuff, even after 10 moves of book theory; and secondly, I know nothing about the Caro Kann Defense, which I offered as a response to his 1.e4. GM Christiansen comfortable, even with seasoned tournament player. Three more seasoned tournament players ponder their positions . . .
chats with BCF board member and WCM Natasha Christiansen, Larry's wife. the boy gets some fatherly advice . . . Yesterday, everyone came to play! The curious came to watch and to play . . . Happy Holidays to all, and please join us again for the next simul on January 8th, 2013! Grandmaster (GM) Larry Christian was born on June 27, 1956 in Riverside, California. 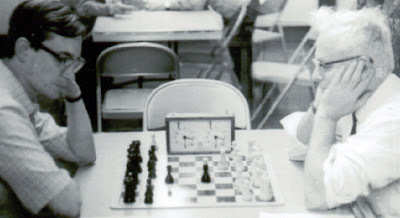 In 1971 Larry won the National High School Chess Championship and from there went on to win the US Junior Championship in 1973, 1974 and 1975. 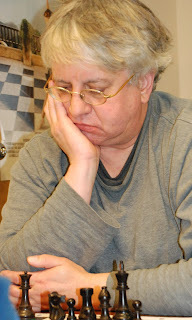 LarryC was United States Chess Champion in 1980, 1983, and 2002. 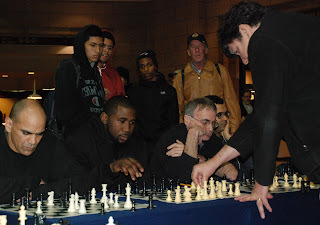 Larry also lent his talents and energy to the United States Olympiad Chess team, participating in 1980 (USA 3rd), 1982 (USA 3rd), 1984 (USA 3rd), 1988, 1990 (USA 2nd), 1992, 1996 (USA 2nd) and 2002. GM Larry C has published 2 chess books: Storming the Barricades (2002) and Rocking the Ramparts (2004). 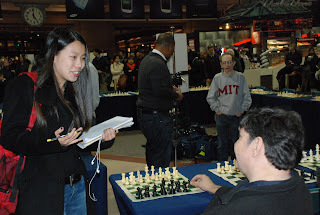 BU Journalism Graduate Student, Joy Lin, interviews Larry C before the event. 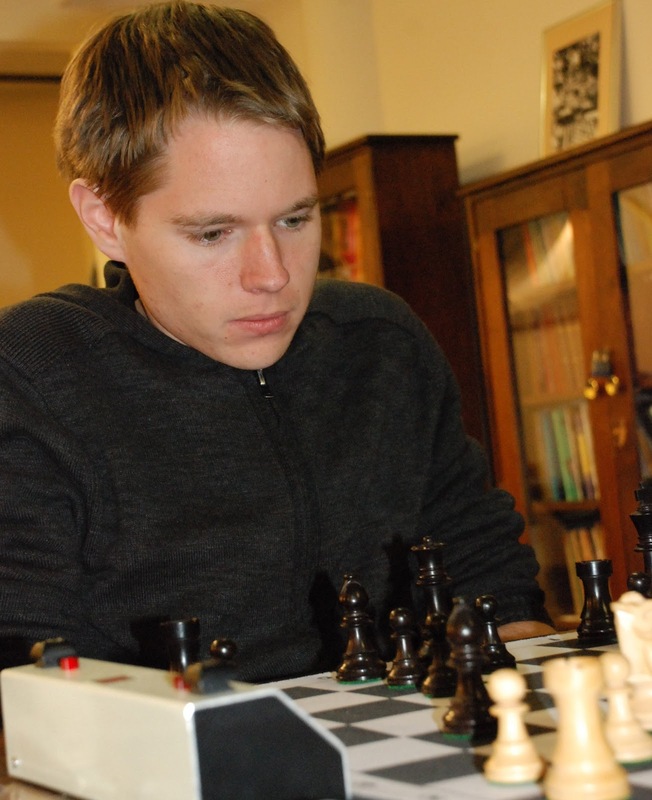 With a 2652 USCF, Christiansen is the highest rated chess player in Massachusetts and 14th in the USA. The Boylston's Bernardo Iglesias (left, sitting) watches as GM Christiansen makes his move on their game. 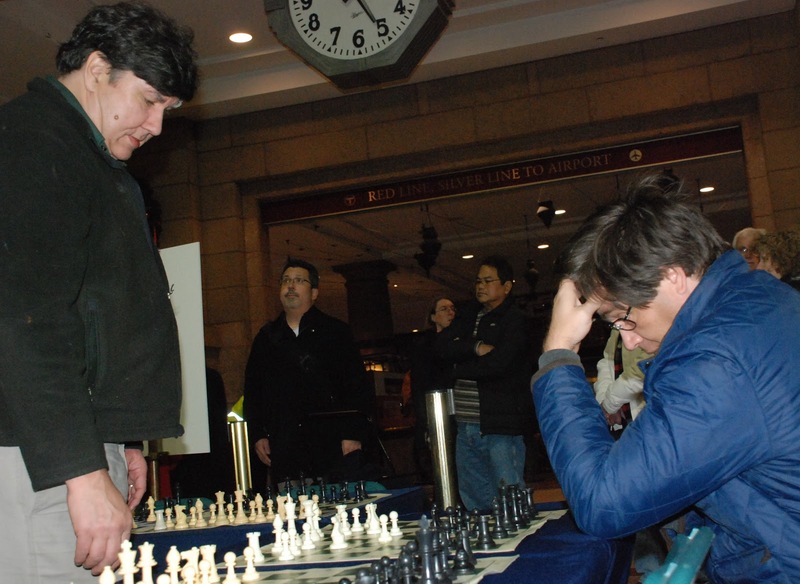 Spectators have one eye on the chess and the other eye on the electronic arrival/departure board, waiting for their trains to take them home from South Station after hard days work. GM Christiansen is OK with the situation if you choose to play him and you are in the middle of a game and you hear the call for the boarding of your train, so you have permission to abandon the chess game in progress without incurring Larry's wrath. 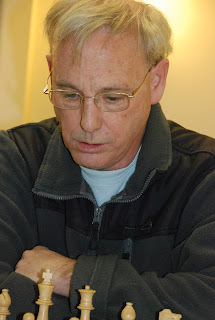 The Captain is the last man sitting, yet also defeated by Larry C. On this 2nd Tuesday of the month, there were no players who won their game or even drew. 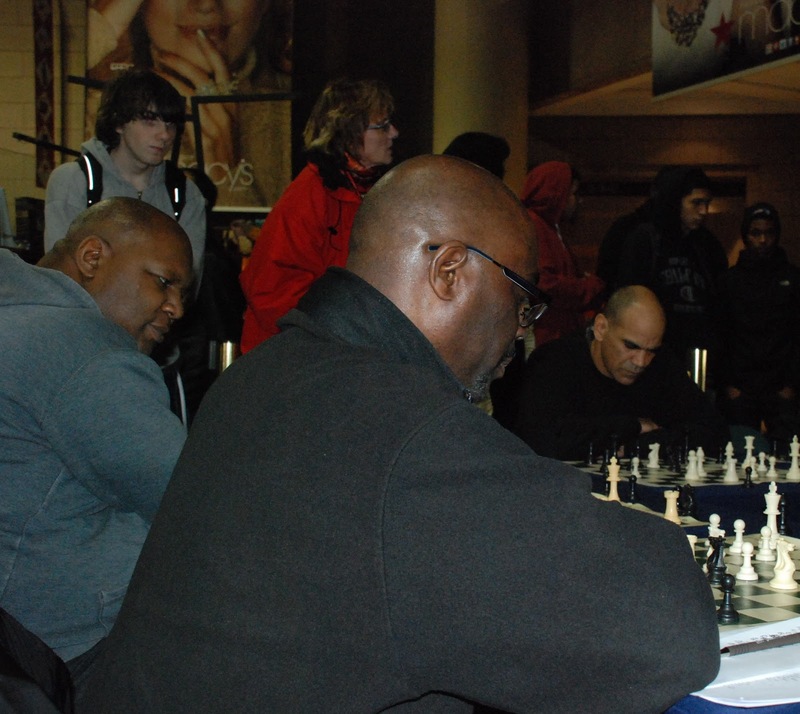 At the same time, the crowd enjoyed every minute of the chess spectacle and the participants were pleased to try their hand at chess: the Game of Kings. So join us this Tuesday to play against one of the greats of American chess!